It’s an interesting little piece, and an excellent edition for the die-hard fan that can’t get enough of who these characters are and where they come from. This book lets you in on all the little details that might have helped inspire the authors in telling their story, and creating their backgrounds. The fact that many of the places mentioned in the series (the landmarks, the school, even the cat rescue place) exist. The school IS real. However in reality, it’s a medieval looking Catholic school. Some landmarks are presented in the series as they once were (abandoned and creepy) – a haunted mansion, even the tunnels. But the author of that chapter indicates while some of the places are exactly as described, some of them are now restored and open to tourists. In fact, St. Martin’s Press intends on giving us a virtual tour on their website. Mind you, some of Tulsa’s officials aren’t exactly excited about the attention they’ve received. There’s even an interesting comparison between the story of the fallen angel (Lucifer) who angered God (we all know what happened there), and Kalona who was cast out by Nyx. It’s a great collector’s piece as we get some factual insight into the “world” that P.C. and Kristin Cast created. But be prepared. This book is essentially a history lesson. Essay reports about different subjects that relate to the series. Plenty facsinating to the fans who are insistent on absorbing anything and everything “House of Night” (even a history lesson or two!). This would be a great addition to the school library. Sounds interesting. I always have such a vivid picture of the school and tunnels in my head when I’m reading. I would love to read this because I loved the series! This sounds so similar to J.R. Ward’s The Black Dagger Brotherhood An Insider’s Guide. A new book. Yeah. Love this series!! Oh this is wonderful! I would love to get a copy of this book. I can’t wait to read it! I would love this, I was considering buying it! I have bought all the other books the week they came out! I really appreciate your book reviews. You keep me well informed!! I love this series–it helped that I discovered it late in the game and could eat through the books one after another! Just found your website and fell in love instantly! You’ve read all the books that I love and so many more I can’t wait to start reading 🙂 Gonna have to suggest you to my bookclub gals! 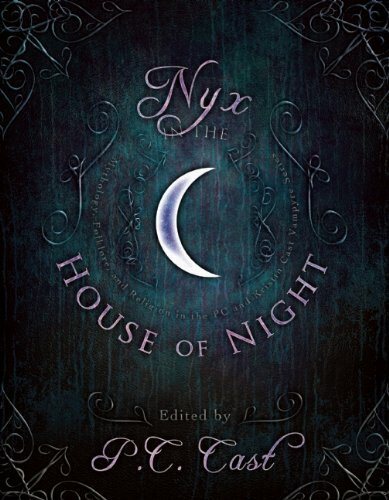 I am totally addicted to The House of Night series! I’m waiting (impatiently) for the next book to come out! I didn’t even know that this book existed until now! I will be finding it and buying it within the next couple of weeks!! 😀 I really enjoy reading your book reviews and I’m gonna look you up on FB so we can discuss some of the other books that we have in common! Thank you for what you do!